The governments are usually considered as the main drivers of CSR policy. However, there are other actors within society, such as civil organisations and industry. It is within this context that a relationship framework has been suggested by Mendoza (1996) and Midttun (2005). Inevitably, it seems that there was a need for a deeper understanding of the governments’ role and function in promoting CSR. Societal governance is intrinsically based on a set of increasingly complex and interdependent relationships. There are different expectations and perceptions within each stakeholder relationship, which have to be addressed to develop an appropriate CSR policy. Essentially, this relational approach is based on the idea that recent changes and patterns affecting the economic and political structure may transform the roles and capacities of various social agents (Albareda et al., 2009). 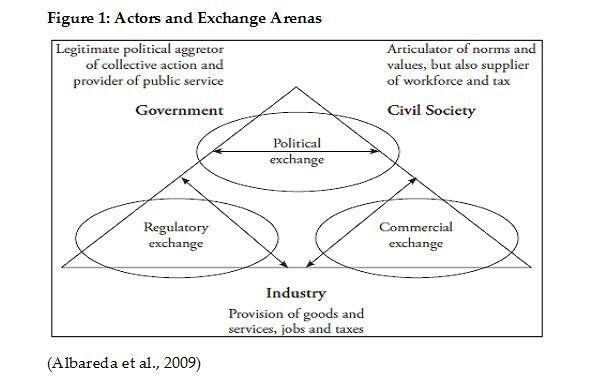 The exchange relationships among different actors and drivers which are shaping CSR policy and communications are featured hereunder in Figure 1. According to Golob et al. (2013) CSR communication is concerned with the context / environment within which CSR communication practices take place. The authors went on to say that it is necessary to observe CSR communication processes between organisations, (new) media and stakeholders. Apparently, several governments have chosen to draw business further into governance issues without strictly mandating behaviour and specifying penalties for non compliance. For example, the UK government’s Department Innovation and Skills, DBIS website states: “The government can also provide a policy and institutional framework that stimulates companies to raise their performance beyond minimum legal standards. Our approach is to encourage and incentivise the adoption of CSR, through best practice guidance, and where appropriate, intelligent (soft) regulation and fiscal incentives”, (DBIS, 2013). Similarly, in the context of high unemployment levels and social exclusion in Denmark, Ms Karen Jesperson, the Minister of Social Affairs (2003) had unveiled the campaign entitled, “It concerns us all”, which drew attention to the ways in which CSR could assist in addressing public policy problems (Boll, 2005). In a similar vein, the Swedish governments’ CSR initiative had called on the companies’ commitment in upholding relevant international standards. In Australia, the former prime minister, John Howard had formed the Business Leaders’ Roundtable as a means of encouraging business leaders to think about how they could assist government in solving the social problems (Crane et al., 2009). Arguably, the governments can facilitate CSR implementation by setting clear frameworks which guide business behaviour, establishing non-binding codes and systems, and providing information about CSR to firms and industries. For instance, the UK and Australian governments came up with the notion of CSR as a response to mass unemployment. They set public policies which have encouraged companies to engage in CSR practices by providing relevant work experience and training opportunities to job seekers (see Moon and Richardson 1985, Moon and Sochacki, 1996). Similarly, the EU institutions have frequently offered trainee subsidies and grants for education, including vocational training for the companies’ human resources development (EU, 2007). Governments’ role is to give guidance on best practice. Japan is a case in point, where there are close relationships between government ministries and corporations. The firms in Japan report their CSR practices as they are required to follow the suggested framework of the Ministry of Environment (Fukukawa and Moon, 2004). Apparently, there is scope for the respective governments to bring their organisational, fiscal and authoritative resources to form collaborative partnerships for CSR engagement. National governments may act as a catalyst in fostering responsible behaviours. For instance, India has taken a proactive stance in regulating CSR as it enforced corporate spending on social welfare (India Companies Act, 2013). With its new Companies Bill, India is pushing big businesses to fork out at least two per cent of their three year annual average net profit for CSR purposes. Clause 135 of this bill casts a duty on the Board of Directors to specify reasons for not spending the specified amount on CSR (EY, 2013). It mandates companies to form a CSR committee at the board level. The composition of the CSR committee has to be disclosed in the annual board of directors’ report. The board will also be responsible for ensuring implementation of CSR action plan. The annual Director’s Report has to specify reasons in case the specific amount (2% of the Profit after Tax) has not been utilised adequately. IB (2014) has recently estimated that around 8,000 companies in India will be shortly accounting for CSR-related provisions in their financial statements. These provisions would closely translate to an estimated discretionary expenditure between $1.95 billion to $2.44 billion for CSR activities. In a similar vein, the European Parliament passed a vote to require mandatory disclosure of non-financial and diversity information by certain large companies and groups on a ‘report or explain’ basis. This vote amended Directive 2013/34/EU and affects all European-based ‘Public Interest Entities’ (PIEs) of 500 employees or more as well as parent companies (EU, 2014). This is an extract of a paper that will appear in the Corporate Reputation Review, Vol. 18 (2).